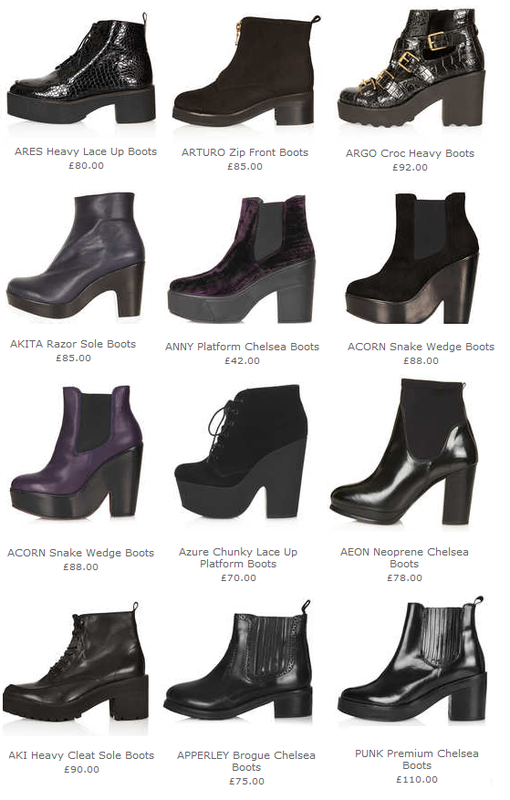 Firstly I will stick my middle finger up to Topshop for having the best collection of dam boots EVER this A/W. Just look at these babies, if you don't like all of them, you like at least three pairs.. and if you don't? Then I don't quite understand why you're on my blog and I don't think we can actually be friends. I haven't been on Topshop 'shoes' for ages, and this is why.. I tend to be quite hard to please with shoes actually and I live in comfy platforms. My shoe collection isn't the biggest but I fear that I've stumbled across a death trap in terms of my 'must-have' list. Topshop shoes always come at a price but you really can't fault their quality at all.. I have a few pairs of boots from Topshop and the quality is outstanding. My favourite here definitely are the ANNY velvet boots which are also the cheapest? I already have some grey skinny leigh jeans that I need in my life from Topshop and these boots are acceptable in price in comparison to others so I feel that with student discount and the fact that I already need these grey jeans that I've mentioned I can somewhat justify getting them, right? Ok Awesome.